The Cruden Bay clubhouse sits serenely above the golf course, providing an excellent view along with a much-needed post-round pint. 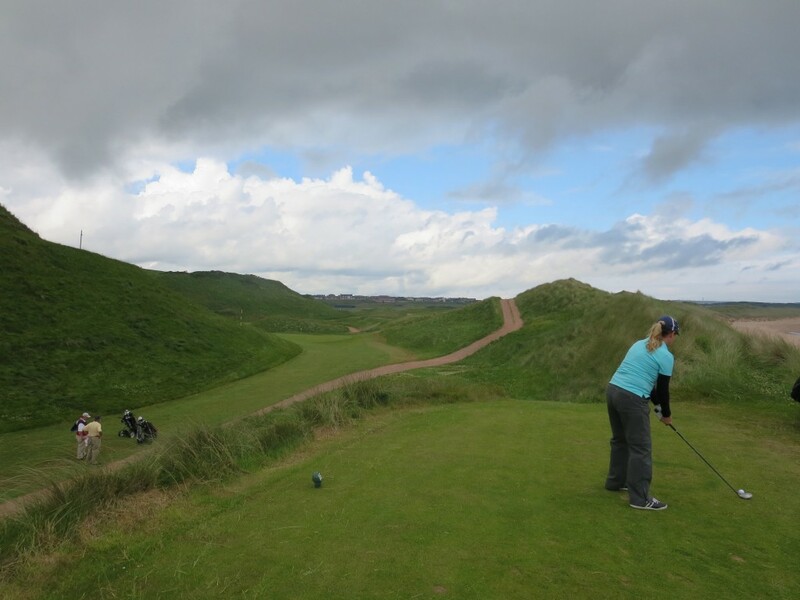 I had trepidations about making Cruden Bay the first round of our trip. I had heard so much about it, I knew it would be special. And I not only feared setting the bar too high right off the plane; I also wondered if we’d enjoy Cruden Bay more with the benefit of a warmup round elsewhere. But some of our friends were playing there that day, and we wanted to share the experience with them. Fortunately, Cruden Bay turned out be a great place to start. It’s mesmerizing and pure, as fine an example of Scottish seaside golf as you could ever hope to see. The drive from Aberdeen was about 45 minutes. After the initial bustle of that thriving oil-centric city, it was a quiet ride through the countryside. 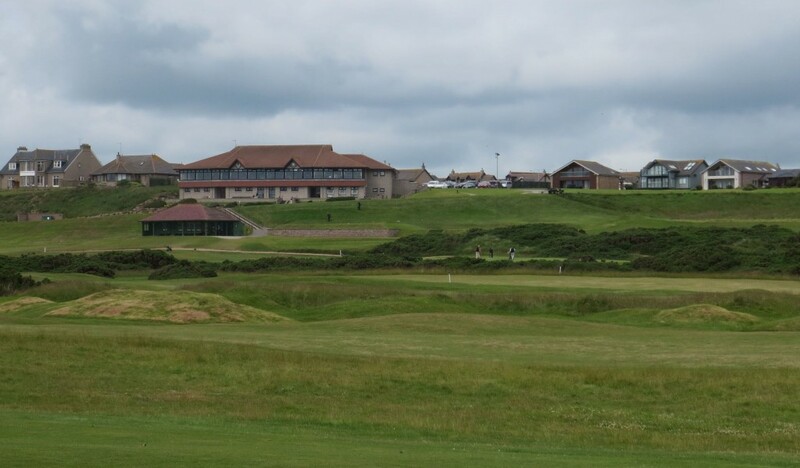 When we pulled up in the car park, we found a very comfortable clubhouse perched on a bluff that overlooked a good chunk of the course and the North Sea beyond it. There was also a view of Slains Castle, believed to be the inspiration for Dracula author Bram Stoker, who visited the area before writing his chilling 1897 novel. As you stand outside the clubhouse, you realize what all the fuss is about. Cruden Bay, a consensus member of the top-100 courses in the world, oozes all the things that is beloved about links golf. Designed by Old Tom Morris with the aid of Archie Simpson, Cruden Bay opened in 1899, spurred on by the railroad expansion responsible for the wave of seaside courses that opened in the late 19th century. But evidence of a nine-hole course on the site goes back to 1791. Enjoying a pint and the excellent view from the clubhouse after our round, we had the pleasure of meeting Cruden Bay general manager Les Durno, who had recently completed 72 holes in one Summer Solstice-aided day with his son—on four different courses, if I recall correctly. My marathon golf days are over. In case yours aren’t, the sun rises around 4 a.m. and sets around 10 p.m. in Scotland in late June. The lofty 10th tee at Cruden Bay provides a panoramic view of No. 10, the par-three 11th, the par-five 13th and Cruden Bay itself. But now for our golf. . . The front nine is dominated by hilly, sloping dunes. Length is generally not an issue, and there are many places where a ball that isn’t perfectly straight avoids the gorse and heather. The course measures 5,850 yards from the visiting men’s tees, but ambitious golfers can back it up to 6,287 or even 6,599 yards. The 36-34 layout has two par 5’s and four par 3’s, including the make-or-break 15th and 16th holes. No. 15 is a 190-yard blind shot, No. 16 is a 172-yard downhiller. Playing those two well, as I did, can ease a lot of earlier pain, which I also inflicted. Even from Cruden Bay’s forward tees, the blind shot at the par-three 16th requires trust and a confident swing. But the joy of Cruden Bay is the way it takes golfers on a journey over a classic stretch of dunes and hills, with a wide variety of interesting but not overwhelming (most of the time) links experiences. On the first tee, for example, a ball struck down the left side will kick right onto the sloping fairway, but there is enough room to make a less precise shot work. The approach to the high green poses a blind-shot pitching challenge from second shots that end up short and right, which is easy to do. The second and third holes are short par-fours, with the the third a mere 264 yards down to a hidden and slippery green. As interesting as the opening holes are, the middle of the course becomes increasingly remarkable, and often for very different reasons. The par-five sixth hole, for example, features a green that’s tucked around to the left of the fairway. If you don’t smoke your first two shots, you’ll need a blind third shot to reach a green that sits up high. There’s also a burn across the fairway to catch third-shot bailouts. I hit what I thought was a decent third shot that cleared the burn to the right of the green. I not only never found it; I ddn’t even know where to look for it..
By contrast, the short par-four eighth hole, a 232-yard downhiller to a steeply pitched plateau of a green, is easily within reach of good hitters. Even my drive came perilously close to the putting surface. The catch is, the green sits up high. To land a tee shot on it and have it stay there is far different than merely hitting the ball far enough. Even my pitch, which was a little too hot, left a nasty downhill putt. Meanwhile, Liz and our friend Ira putted up a steep fringe surface that demanded a deft touch. On the back nine, the course moved closer to the sea. The views were dazzling, and the holes seemed to get more fun as we moved along. As much as I was in awe of the front nine, the back nine is etched in my mind. Part of that was because it had some inviting holes, and part of it was because I hit the ball better. 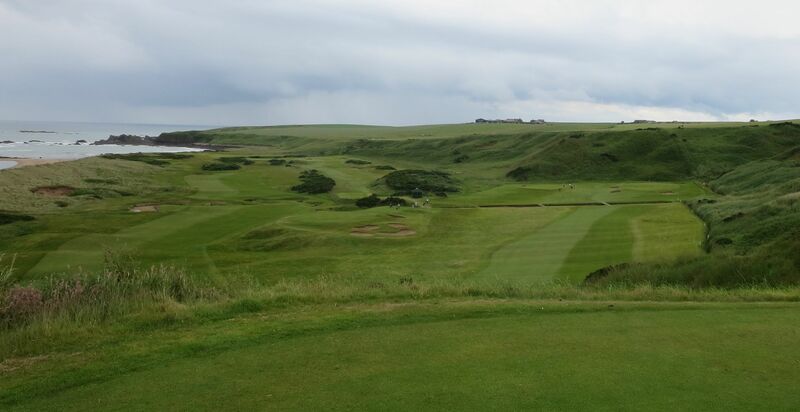 The 10th tee, which sits atop a bluff, offers a majestic view of the course and Cruden Bay beyond it. No. 10 is also a fun hole that allows a roomy tee shot, but requires a careful approach to an undulating green that sits behind a burn. 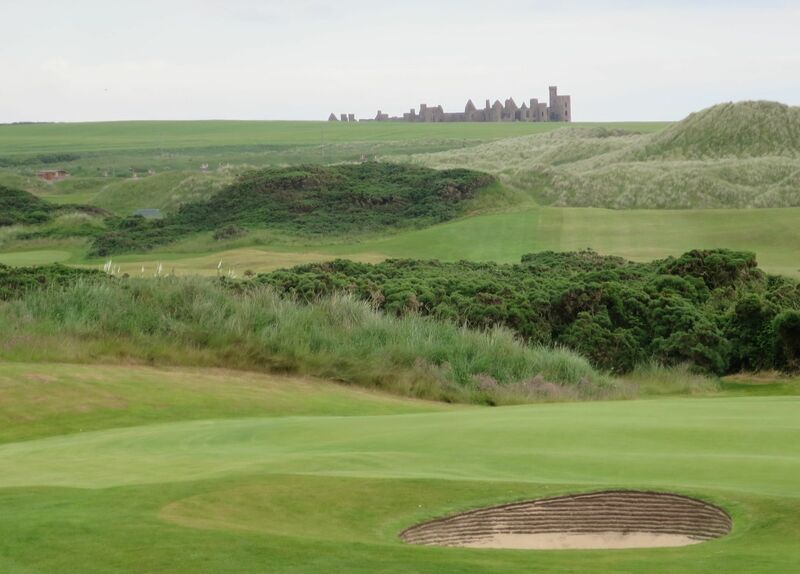 Among the seaside classics we have played, Cruden Bay is right there with Royal Dornoch and the North Berwick West Links. History aside, Cruden Bay also stands up well against Open legends like the Old Course and Turnberry. Please click on photos to see enlarged view.